When summer hits, Matt and I are notorious for the cold salads, as you could tell with my last post about potato salad. But our main summer salad? 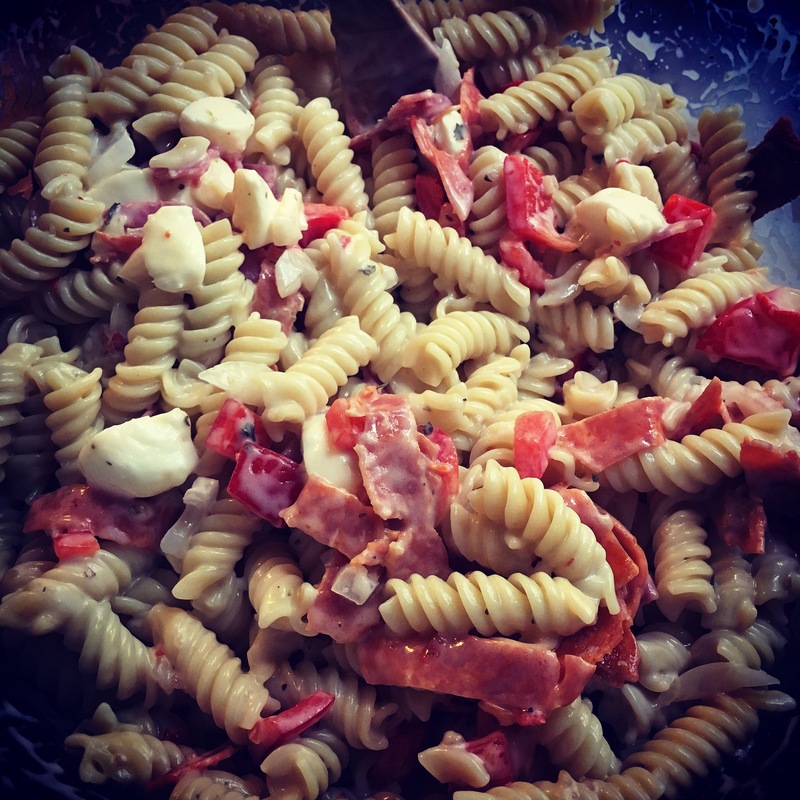 Macaroni salad. We never make it the same way twice, always just grabbing for whatever is on hand in the fridge to try and utilize our food in different ways. Sometimes it’s as simple as onion and celery, other times I toss in some pepper with the onion and maybe some artichoke, and sometimes I pull out some of our frozen veggies and toss a little broccoli and peas in. This week I felt compelled to make an Italian-style salad with pepperoni, genoa salami, red pepper, and fresh mozzarella. Now normally I would add Italian dressing to the mix, but if you’re like me, this salad is always subject to all the ingredients (minus the pasta) dropping to the bottom of the bowl. And the more you mix, the more it goes. But not this time. I was determined to incorporate Italian flavors from the dressing and create a cohesive dish. And it hit me: Creamy Italian Dressing! When I make a mayo-based macaroni salad the ingredients never fall to the bottom. Instead, the mayo acts as a cohesive and creates the perfect blend ratio of pasta to its edible accoutrements. And I must say, it was a success! To add a little more zip, you can always whisk in a little bit of the regular Italian dressing. Trust me, the Creamy Italian will still do its thing. More importantly, before you serve, always make sure to add just a little dollop more of the Creamy Italian Dressing. When sitting in the fridge, the pasta has a tendency to sop up a lot of the liquid, so that little dollop rejuvenates the dish a little bit. 1) In a large bowl, add pasta, pepperoni, salami, mozzarella, red pepper, and onion. Mix. 2) In a 2-cup measuring cup, add Creamy Italian and Italian dressing. Whisk together until smooth. 3) Add dressing over pasta and mix thoroughly. Sprinkle Italian Seasoning over mixture, just a few taps, and mix. 4) Cover and refrigerate minimum 4 hours to overnight before serving.